Following the launch of Waterlock, the connected ”escape of water” prevention system, at the BIBA Conference in May, the product’s developer, geo has announced a formal strategic partnership with inet3, the property underwriting agency and specialist in property insurance. Sending a clear signal to the insurance industry of the myriad of benefits that Waterlock offers in terms of reducing the incidence of escape of water claims, the two companies will combine their respective expertise and experience to empower and support insurance brokers and claims companies who work with both insurers and policy holders. Waterlock delivers three key benefits. 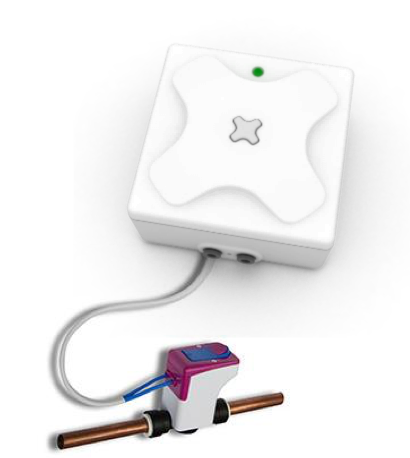 The first is that it gives homeowners the power to control the mains water stopcock remotely, either from the Waterlock Valve Controller, or from the app on their smartphone. The second is that it can automatically detect and control leaks using wireless sensors around the home which detect standing water or an increase in humidity. These then activate the Waterlock Valve Controller to close the stopcock and send an alert to the homeowner via email, text message or the Waterlock app. The final benefit is that, as risk is reduced, so insurance premiums will come down, saving money for both the policyholder and the insurer. geo and inet3 will be focusing on insurance companies that specialise in policies for renovated and unoccupied homes, holiday or second homes and those belonging to vulnerable customers, such as the elderly and disabled or those in assisted living. It will also highlight the benefits of Waterlock to brokers whose customers have already experienced a leak, and who are statistically more likely to experience a second escape of water incident. 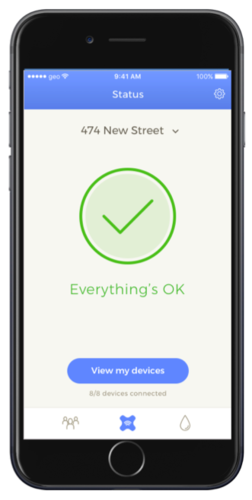 geo was founded in Cambridge in 2006, the award-winning brainchild of CEO Patrick Caiger-Smith and Non-exec Director Simon Anderson, both intent on revolutionising the smart home interface in a bid to encourage consumer engagement and a greener way of home living. Their commitment to making a positive impact on energy consumption drove them to found geo, even winning a Shell Springboard regional award in their first year of business. From those early pioneering days, the company has enjoyed continued growth and is one of the success stories of the smarter energy business. Following the launch of their first product, Solo, in 2007, geo has gone on to design, develop and supply a broad range of products and services, offering simple but intelligent user interface and delivering clear, understandable information about the energy being used. Their Cosy won the IDA Silver Award (International Design Award) in 2015. So far geo has delivered close to 5 million systems to homes throughout the UK and Europe, and they’re currently the leading provider of consumer feedback devices and services to the UK Smart Metering Programme. They are also trusted by multiple utilities, meter providers and energy installers, who sell geo products on to their own customers. From their Cambridge headquarters, Patrick continues to lead a formidable team of experts in renewable energy, engineering, business and finance. This was acknowledged in 2017 with geo’s selection for a Queen’s Award for Innovation. inet3 are a Managing General Agent (MGA), specialising in UK property underwriting. Innovative in their approach, they have designed and built their own insurance trading platform, and have long standing relationships with leading Brokers, IFA’s, Network’s and Affinity Partners. Trading for over 25 years, inet3 are also a Lloyd’s of London Broker, working closely with a number of leading Lloyd’s Syndicates in addition to mainstream Insurers. inet3 are committed to technological solutions being a core part of their underwriting strategy and have identified that preventative measures are an intrinsic part of Treating Customers Fairly (TCF). Their primary focus is to help clients mitigate the disruption caused by Escape of Water, which is now one of the biggest causes of claim in the UK property market. At the heart of inet3’s business strategy is the recognition of technology being instrumental in protecting their clients and empowering the Insurance Broker community to have access to innovative property insurance products. This press release was distributed by ResponseSource Press Release Wire on behalf of Zaboura Consultancy (ZCL) in the following categories: Home & Garden, Environment & Nature, Consumer Technology, Personal Finance, Business & Finance, Public Sector, Third Sector & Legal, Manufacturing, Engineering & Energy, Construction & Property, for more information visit https://pressreleasewire.responsesource.com/about.